A regular in cat 2/3 road races this season, Benoit Ramsey also likes to tackle challenging European sportives. And they don’t come any bigger than the Tour du Mont Blanc. Although known by some as the ‘Daddy’ of mountainous European sportives, for me, the Tour du Mont Blanc represented a completely different type of challenge, writes Benoit. 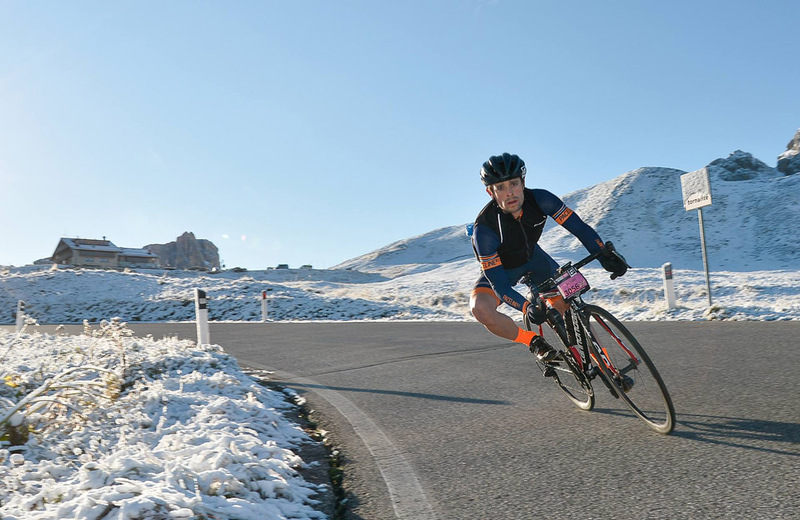 A one day event encompassing 330km and 8000m of climbing across nine fairly hefty climbs, in three different countries – the ‘full gas’ approach you could employ when taking on a Maratona or the Etape, for example, was not an option. When I signed up in late 2014 I had earmarked the TdMB as a major focus for the following year, having really enjoyed my longer distance rides that year. However, I had lost sight of this as I eased gingerly into “proper” racing on rather flatter courses, over substantially shorter time intervals, with my very friendly new teammates from Paceline. As such, the big day crept up on me somewhat – suddenly, I found myself furiously planning for a one day event involving an unwarranted amount of logistical faff. Full beam lights for the morning, spare batteries, inordinate amounts of food and drink, multiple clothing options – I felt sure I was going to forget something. Thankfully, my Dad – who was on a week of training nearby – had volunteered to drive as support for myself and a friend, Neil. I had put in the winter base miles, completed some long trial runs in the early summer, and worked on my lengthy efforts at moderate heart rates. So I was ready, but perhaps not in the best place mentally. In particular, I had utterly failed to lose the few extra kilos I had been planning to shift, and, inevitably, became fixated on that in the run up. I agonised over the extra graft required to climb 8000m at weight of 67kg rather than 64kg. Then, the sober reminder – who gives, just enjoy it! The other TdMB participants appeared to be a strange mix of those, like me, making the step up from more ‘normal’ length endeavours, and a motley band of weathered audax and ultra veterans for whom this was likely to be a something of a walk in the park. We lined up in the dark, at 5am, on the top of a mountain – but it was warm – ridiculously warm, and I immediately regretted the extra layers I had opted to start with. Descending from Les Saisies in the dark was an awesome experience, though there were some early casualties here from overly-eager participants taking it too fast, with sub-standard lights. Descent safely negotiated, as we hit the valley, I was terrified of going out too fast, and had opted for an ultra conservative strategy – managing my wattage religiously. As such, on the first open, flat section, I was torn between watching the numbers and trying to stay with the front group. But when people spiked up to 350W, I just let the wheels go and settled in for the long haul. As things settled down and dawn arrived, I re-found Neil, and we rode conservatively through the undulating (in comparison to what was to come) first section of the course. On the first few “short” – five or six km – climbs, we were passed by many people. Were we on bad form, or was everyone else forgetting we had an entire day in front of us? A glance at my power meter gave me hope: I’d need to do about 90% of FTP to hold wheels. Surely, people would pay for this later!? As Chamonix came into view my stomach became more and more uncomfortable, and I started to realise an emergency pit stop was in order. I must have been quite a sight plonking my bike on the side of the road and running into rather a posh hotel at 7am, asking politely but with some urgency whether I could use the toilet. I emerged shortly afterwards and rejoined what had now become a dribble, rather than a train, of riders. I took stock: a couple of hours in and I was already way off the pace, with no riders around me able to help with pacing. From a psychological perspective it was nice to be going past people, rather than being passed, but with no one to share work it was going to be a bit of a lonely journey. I caught up to Neil again maybe an hour and a half later, on the first real test – a 10km climb from Valettes to Champex – about 110km into the day. There were already some people seriously struggling at this early stage! At an average of 8% – with some far steeper ramps – it was very difficult to stay in my target power zone and keep a steady cadence. In the end, it was 51 mins at 240W – with a nice chat to a bloke I spotted from Brixton CC helping restrain me early on. We were even told to ‘shhhhh!’ by a bloke grinding his way up next to us. If you’re in that sort of mood a third of the way in, it didn’t bode well at all! I threw myself down the short descent from Champex and took the second of a number of very efficient pit stops with the paternal support car [unload pockets, swap both bottles, toilet break, new nutella sandwich – all in well under a minute] at the base of the first real test, the Col du Grand St Bernard, a monster 25k climb with 1600m of ascent. I was feeling stronger and stronger, and, in retrospect, 230W for 1 hr 46 mins was probably pushing it a bit for me, and was probably behind my weaker numbers later on (so much for the negative split). It was on the upper slopes of this endless mountain – when the gradient hits a solid 8% for the final 6km – that it appeared many competitors were paying for their earlier exuberance. Bodies all over the place, and we were barely halfway. Forty minutes of descending at an average of 50kph into the valley near Aosta in Italy (giving me a rare downhill segment top five placing on Strava) saw a few more kilometres tick by, and now, with 200km under the belt, there were few other riders around. Sometimes 20 minutes would pass without anyone coming into view, and I’d begin to panic about having gone the wrong way. Anyway, there was the odd one, and, quite keen for a tow in the valley, I put in a bit of an effort to bridge up to a rather professional looking girl who had just swapped in for her boyfriend for the second leg of the relay, and thus was understandably more energetic than me. I was very dismayed when, being the responsible tourist I am, I stopped at a red light, and she blew straight through! The same happened about 5km further up the road, just as I had put in a bit of an effort to catch back up, and I finally gave up, trying to settle into a good rhythm for what was to be a long, lonely slog in the valley. Things become a little hazier past this point. I actually can’t properly visualise the upper slopes of the Petit St Bernard, but I do remember the pain in my legs… 210W or so for the hour and quarter of climbing (depending on where you judge the climb to have started), but I still felt like I had a fair amount left in the tank. By this point, it was a bit of an event when you came across another rider, and everyone was locked into a single, unswaying pace. Say hello, exchange a grimace, and back to your stem again. I finally caught the traffic light jumper on the descent of the Petit St Bernard, then inched past her on the lower slopes of the penultimate climb, the Col du Roseland – a horrible, rampy 20km slog in normal circumstances, and a frankly disgusting one with 275km already in the legs. I now pretty much topped out at 250W, and could just about hold 210W for a sustained period, even though I couldn’t really feel my legs anymore. I passed a few more here – some in real trouble – bowel issues, cramp, who knows. I gave my best encouraging smiles, but a few were clearly strongly considering getting into their cars. Then, another fast descent and, at last, the final ascent back into Les Saisies. Again, 210W – no more no less – and all I could stomach was Haribo, handed to me every few kilometres out of the car window. Here, I finally passed a couple of guys I had known were close to me all day, doing a very similar speed. I must have seen their wife-piloted support cars stopped by the road thirty times but had never actually seen them! The last 3 or 4 km were very special, but my mood gyrated a bit from the stomach pain (I told my Dad very rudely to leave me in peace at one point, then immediately regretted it). In the finishing village, I tried to sprint the last 500m, but there was genuinely nothing there, and I rolled across rather sedately, but very, very happy. All in all, this was one of the best days I’ve had on the bike. The event itself feels much more intimate than any of the bigger sportives I’ve done, with a real sense of camaraderie amongst participants. I finished in 13 hours and 32 minutes (13:10 riding, 22 minutes stopped), in 22nd place out of 450 starters – but over an hour behind the winners (who apparently crossed the line hand in hand in 12:10!). I felt sick for two hours after finishing, but finally settled after a beer and a shower, and I spent a very fun hour between 10pm and 11pm eating a filthy pizza and drinking many pints at a restaurant overlooking the finishing climb, whooping with encouragement at the steady drip of riders finally making it home in the pitch black. The last recorded rider finished at 1am, after 20 hours, and there were many, many “abandons”, as they say in French – around 100, I think). Neil, who had held out very well for a long time, suffered somewhat late on. Having held a gap of around an hour and a half to me for most of latter half of the ride (according to my Dad, who made the journey between us several times – driving over 400km in total on the day! ), he finally cracked on the last couple of climbs and finished in 15:55 – still very respectable and well into the top 50%, despite what must have been one the slowest final ascents of the day! I’ve genuinely never seen someone so broken after crossing the finish line, and he went straight off to bed! Check out Benoit’s ride on Strava.